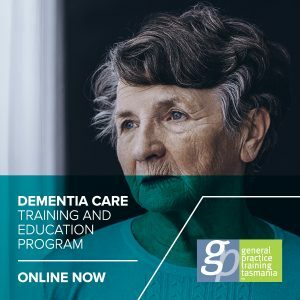 Health professionals are invited to take part in the free Dementia Care Training and Education Program (DCTEP) developed by General Practice Training Tasmania to assist in recognising, diagnosing, managing and supporting dementia patients in their care. This innovative Australian-first dementia care resource was launched in Hobart in March 2018 by Federal Aged Care Minister Ken Wyatt AM MP. The free interactive program was developed with the entire practice in mind. The informative modules can be completed by all practice staff to improve the overall level of service and care provided to dementia patients and their loved ones, from making an appointment through to management of the condition. With aged care services around the country stretched to their limit, the care and management of dementia patients often falls to GPs and Practice Nurses. The DCTEP gives health professionals and their support teams the tools and knowledge to confidently take on this responsibility and provide enhanced support to patients and their carers and loved ones. The program only takes three hours to complete and can be completed in entirety or progressively to fit in with busy schedules. Already, the evaluation of this program has demonstrated some early changes in health professionals’ clinical behaviour, resulting from improved awareness, knowledge and confidence in managing and supporting dementia patients in general practice.